Bacon Jam is an easy recipe to make and great to have on hand. It is an amazing flavor enhancer for toast, sandwiches, burgers, and even in scrambled eggs. 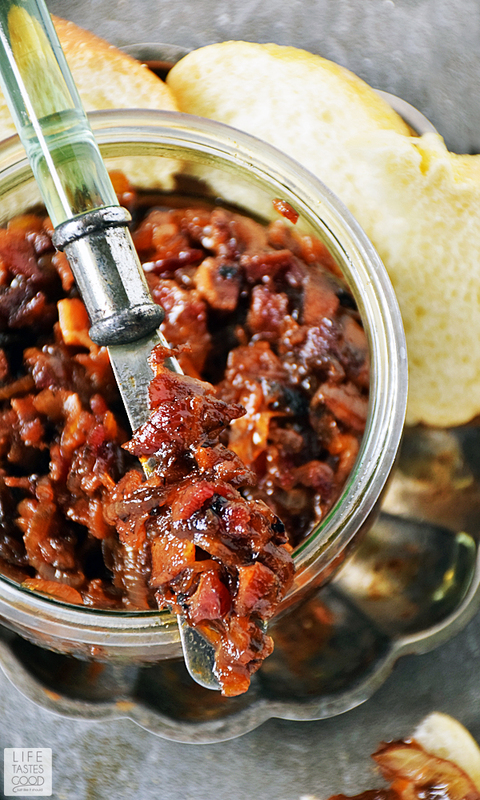 We love to top everything with bacon jam recipe. It is a sweet, savory, and smoky spread! Making Bacon Jam is a little involved and somewhat time consuming, but it is so worth it y'all! Once you have the bacon jam recipe made, you can use it on just about everything. For an easy to make and impressive breakfast, we like to spread bacon jam on a piece of bread, top with some smoky Gruyere cheese and pop it in the oven to melt the cheese. Then I'll top the bacon jam bread off with a poached egg and breakfast is done in under 10 minutes! Bacon Jam is great on a grilled cheese sandwich, spread on hamburgers, or mix it into scrambled eggs. 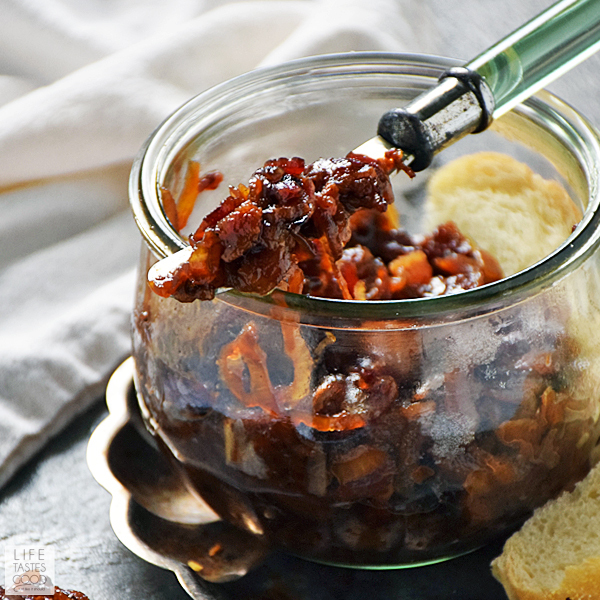 The possibilities are endless with this bacon jam recipe! Cook your bacon in the oven. It is super easy to do and clean-up is a breeze! If possible, make the bacon up ahead of time and reserve until ready to make the bacon jam recipe. Be sure to reserve the bacon fat too. 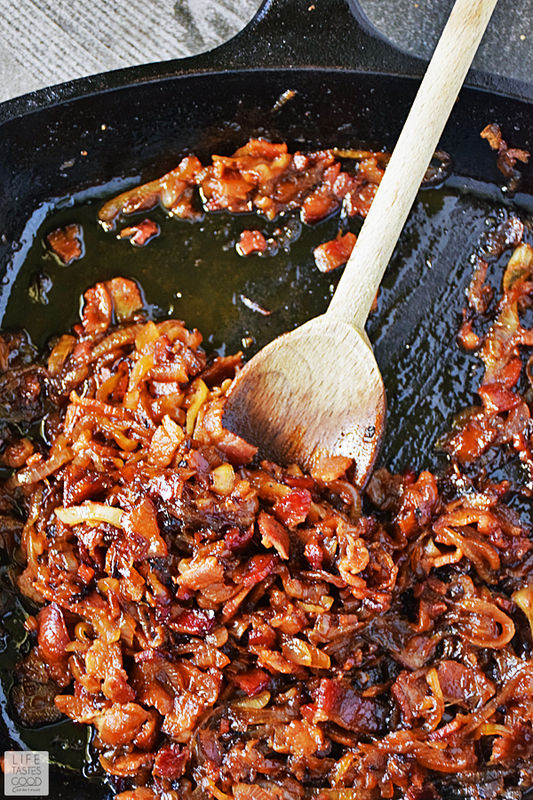 Use a food processor to slice the onions for the bacon jam. Slicing onions is made easy with the food processor slicing blade. It will slice them all up in no time into thin slices perfect for bacon jam. You can chop them further if you prefer the onions smaller. I'm a bit on the lazy side, so I just use them sliced and they are totally fine. Line a baking sheet with foil and top it with an oven safe rack if you have one. If not, you can cook the bacon right on the foil. 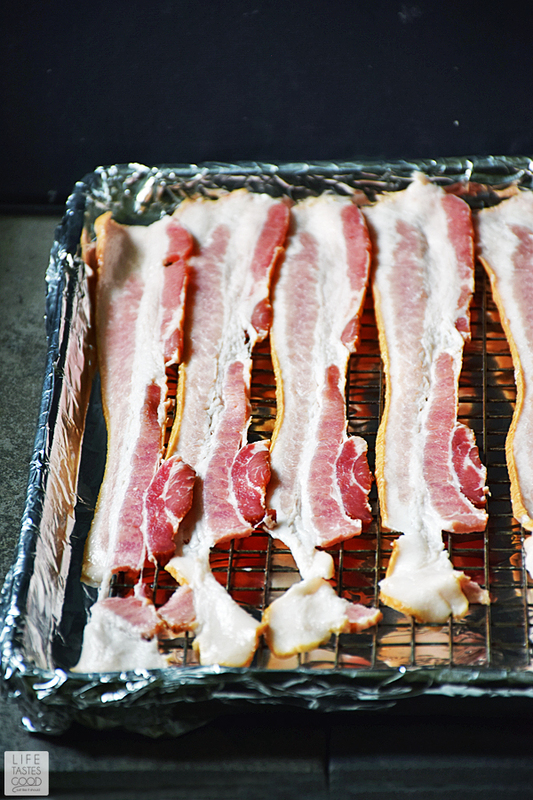 Lay bacon pieces in a single layer on the rack (or on the foil), and place the baking sheet in the oven. Turn the oven on to 400°F and cook for 20-30 minutes until desired crispiness. You'll want the bacon pretty crispy for the bacon jam. When the bacon is cooked to your liking, carefully remove the baking sheet from the oven and transfer the bacon to a paper-towel lined plate to drain. Pat dry with a paper-towel to remove the bacon fat. Reserve the bacon fat left in the baking sheet. 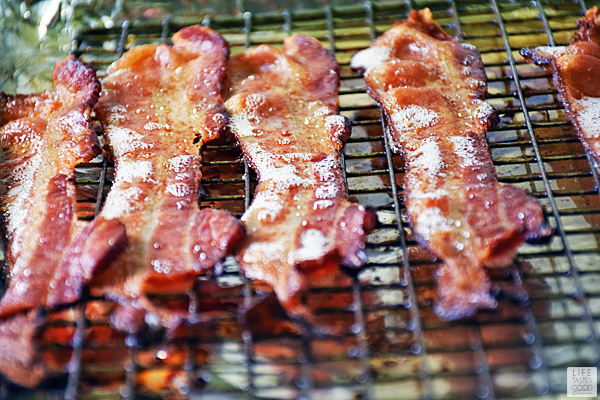 While the bacon is cooking, Heat 2 tablespoons bacon fat over medium heat in a skillet. Add the onions and stir. 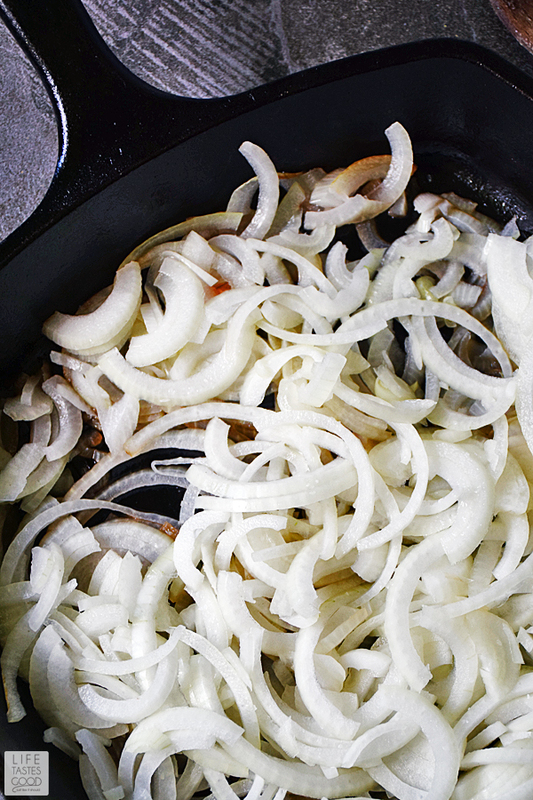 Allow the onions to cook for about 10 minutes. While the onions are cooking, chop the bacon and set aside. After about 10 minutes, you'll notice the onions are starting to turn a light golden color. Sprinkle on a pinch of salt and stir in 3 tablespoons light brown sugar, 1/4 cup sherry vinegar, 1 teaspoon fresh thyme leaves, and a pinch of cayenne pepper. Stir to combine. Add the chopped bacon and stir 1/2 cup water into bacon mixture. Cook until the overall color is a dark brown bacon color and has a jam consistency, about 15 minutes. Give the Bacon Jam a taste and adjust the seasonings to your liking. Allow the bacon jam to cool slightly and transfer to a serving dish. Store bacon jam in an airtight container in the refrigerator up to 2 weeks, although, I doubt it will last that long. As I mentioned earlier. we love to use bacon jam on just about everything, but some of our favorites include the best cheeseburger recipe ever, my Bacon Jam Burger. Another favorite we enjoy around the holidays. My Cranberry Bacon Jam Crostini is one of the best holiday party appetizers because it's amazing delicious and super easy to make too! Bacon Jam is also a great addition to my Poached Egg on Toast Breakfast. Sometimes I use bacon jam in place of the guacamole and sometimes I go with guacamole and bacon jam! 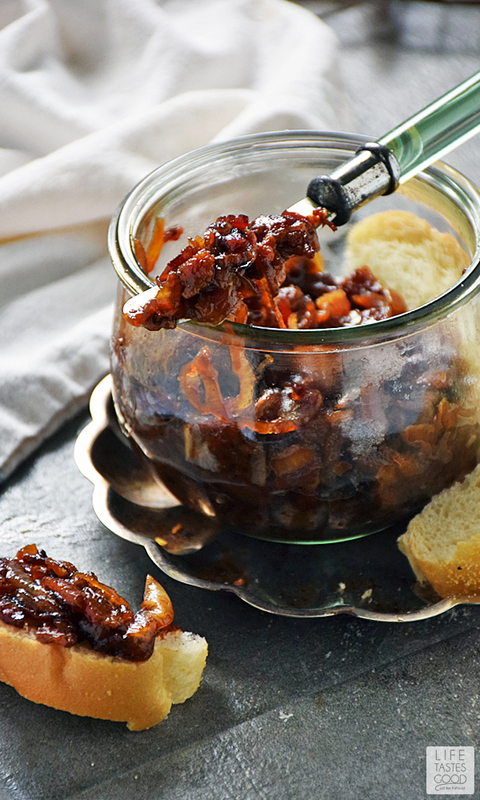 What are your favorite ways to enjoy bacon jam? Share them with me in the comments. I'm looking forward to trying out some of your creative ideas! Bacon Jam is an easy recipe to make and great to have on hand. It is an amazing flavor enhancer for toast, sandwiches, burgers, and even in scrambled eggs. We love to top everything with this sweet, savory, and smoky spread! Heat 2 tablespoons bacon fat over medium heat in a skillet. Add the onions and stir. Allow the onions to cook for about 10 minutes. Allow the bacon jam to cool slightly and transfer to a serving dish. Store bacon jam in an airtight container in the refrigerator up to 2 weeks. Now that sounds like a wonderful plan! I need to make sure I have some bread on hand the next time I cook up some bacon! Thanks for sharing, Laura!! Oh my goodness, the top picture is absolutely mouth-watering. I can't wait to try this - I bet it's truly amazing on a burger! Sounds absolutely wondrous! I can't decide if I want it more on a burger or in a grilled cheese! BOTH! Definitely one of each :) Thanks so much, Lauren! Delicious! Great recipe for my family and I.
Wow - is that jam awesome!! Added Bourbon and using it with chicken waffles at tomorrow's tailgate. Wow - that is awesome jam! Thank you for posting it. I added bourbon and will be putting it on chicken waffles at the tailgate tomorrow! So glad you enjoy it!! Love your idea to put this on chicken and waffles!! Have fun tailgating!! I don't have access to fresh thyme, can I used dried? 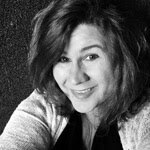 Yes, Coleen, but keep in mind, the flavor of dried Thyme is much different from fresh, so it will affect the overall flavor of the finished recipe. Hi Karen, Great question! No, this is not a recipe you can safely put on a shelf. This recipe should be kept in an airtight container in the refrigerator for about 2 weeks or it can be frozen for future use. I hope that helps! Why is the bacon patted dry. After patting you put it in a lot of fat. Waste of time. Hi Erik, You have to chop the bacon, so patting it dry helps to keep your work surface and fingers a little bit cleaner. If you don't mind getting all that grease on your fingers while chopping, then you can omit that step.